Do you know what it feels like to let loose at one of the world’s craziest parties? 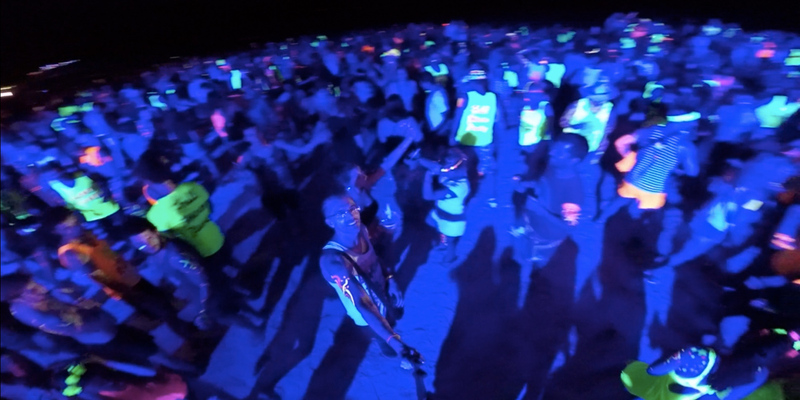 Or how it feels to join 10,000 – 15,000 other revellers and dance the night away under a moonlit idyllic beach? If the answer is no, then we’re sorry to say that you haven’t lived yet! 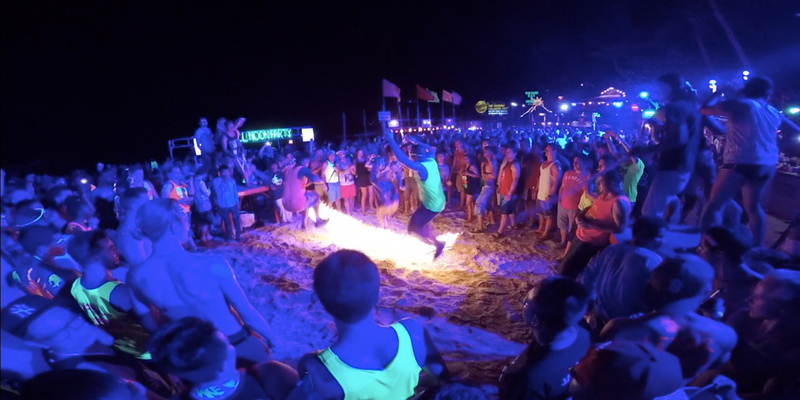 Haad Rin Beach in Koh Pha Ngan is home to the full moon party. 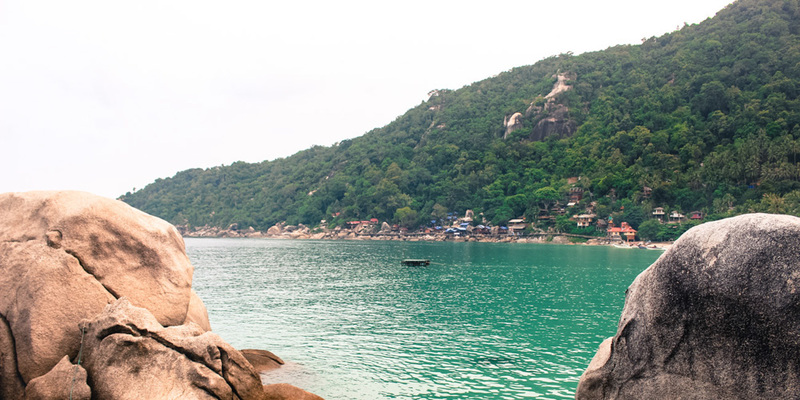 Koh Pha Ngan is an island located in the southeast of Thailand and this particular beach is renowned for its one-of-a-kind celebration that attracts party animals and life lovers from all across the globe. This once in a lifetime party begins at dusk. The beach is lined with small tables decorated with delicately lit lamps and as the sunlight fades away, the party atmosphere starts to unfold with music booming from every corner of the beach. The DJ’s play everything from reggae, or trance to techno in a bid to make sure all music tastes are catered for. The party lasts all night and into the early hours of the morning. This is one party you definitely don’t want to leave early (you’ll never forgive yourself if you do). There are buckets to be drinking from, podiums to be dancing on and ropes of fire to be jumped over so why leave early? Fire is indeed at the forefront of this party with a massive burning sign in the sea being a focal point (also a great meeting point) and it’s a place where the fire dancers show off their immense talents. 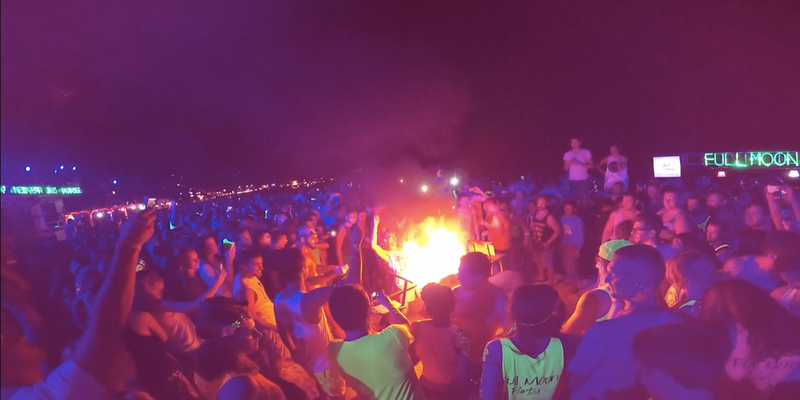 Usually people say, “don’t play with fire”, but you will do the complete opposite at the full moon party. You will be accelerating down fire slides and doing the limbo under fire ropes. And, to top it all off, there will be loads of glow in the dark face/body paints, so much so that you will be head to toe covered in it, even if you choose not to be! It happens monthly but you must check the dates online to see which night the full moon falls on as it is usually rounded off to the weekend. A full list of the scheduled nights can be found here. Once you have unpacked your party gear you can spend some time chilling out at one of the island’s beaches. To the north of the island, you have Mae Haad which is a white sand beach that’s joined by a sand split to Koh Mae. This is the ideal location for relaxation and sunbathing prior to the full moon. It’s also a great place to do some snorkeling. If you arrive the day before the big event, check out Haad Rin beach ahead of the big night for pre-party celebrations. While this will not be as huge as the real full moon night, it still draws in dedicated partygoers and it will give you a taste of what’s to come. It’s D-day and let’s hope you are ready to party like never before! We would suggest taking it very easy during the day as you’re going to want to save all your energy for the full moon.Instead of snorkeling or hiking, spend some time relaxing, enjoying a good meal and drinking plenty of water to stay hydrated. A suggestion for good food is Lazy House, which is located in central Haad Rin and serves western and Thai dishes. The staff here speak perfect English and, just as the name suggests, the place oozes a cool and laid back atmosphere. Next, have a snoop around the local vendors for your neon party-wear. This is not the night to be shy when it comes to outfit choice as the louder your outfit is, the better. This party is all about standing out from the crowd or merely blending in with the sea of neon wash. Entrance to the party is SGD 4.00, an early arrival is necessary, around 10pm, otherwise you will be playing catch up with the partygoers. The selection of alcohol on the night will be wide and drinking from neon colored buckets is the norm. Yes, those buckets you took to the beach to build sandcastles in your younger years will instead be packed with 375mls of boozy goodness. You can get literally anything to drink at the bucket stands so do be careful because some combinations, including Thai whiskey and red bull, can be lethal. A bucket will cost you SGD 8.00. Always order from a sealed bottle, never accept a ready to go bucket! Every bar will be playing a different kind of music, find your favourite one, let your hair down, dance like no one’s watching and mingle with travelers from all over the world. There is also a sleep-zone should you feel like taking a nap but we can’t guarantee you will wake up before the morning. This will be a night you will be talking about for a very long time. 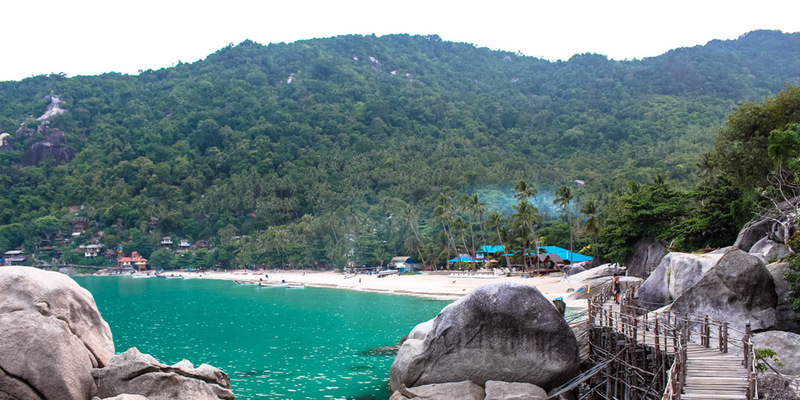 Depending on what time you are returning to Singapore you can enjoy a bit more of Koh Pha Ngan. Fancy relaxing by the beach? Chalokum beach is located on the north of the island. It is about 2 km long and has a calm and transparent sea. As it’s a bit far from the main action usually this beach is empty, perfect for a bit of “me time”. If it’s more party what you are looking for then forget the beach and head to Slip n Fly. A combination of swimming pools, giant slides and music. Yep, you can dance & fly before heading back home. Paradise Bungalows is a 3-star resort located on the beach. You will be in walking distance to the full moon. Rooms start from SGD 31.00. With an amazing swimming pool that offers panoramic views of the ocean, Koh Phangan Bayshore Resort is set right on the beach. Prices start from SGD 87.00. Sarikantang Resort And Spa has two outdoor pools and a full-service spa to recover from the night long party. 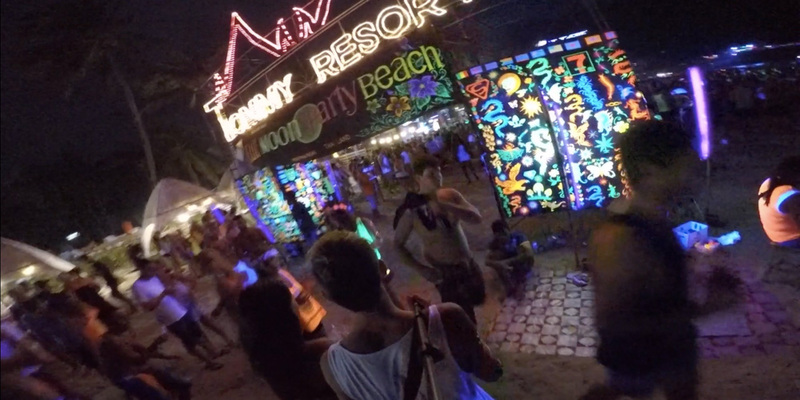 The resort is a ten-minute walk to the full moon party. Rooms start from SGD 101.00. 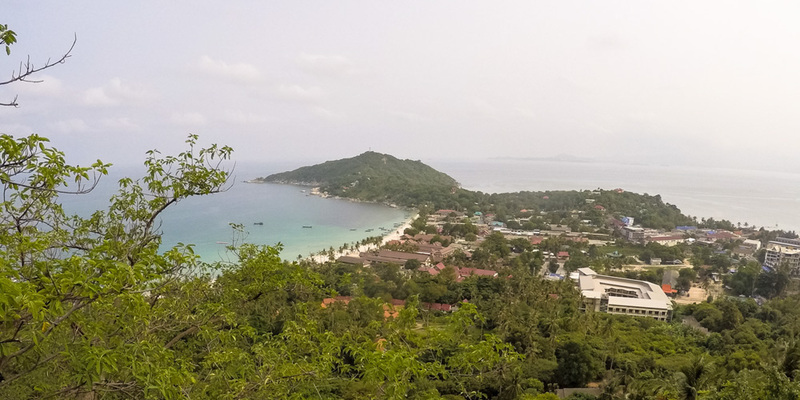 It’s recommended to book a hotel near Haad Rin beach, where the Full Moon Party happens. Of course, there are other options around the island, the thing is, after a night partying you don’t want to spend one hour on a taxi or a shared pick up to get back to your hotel, right? Koh Phangan does not have an airport. The closest airport is on its sister island, Koh Samui, and you’ll be glad to know that Bangkok Airways offer direct flights(daily) from Singapore (SIN) to Koh Samui (USM) at 5:25pm & 8:35pm. Silk Air also offers direct flights, a bit earlier, at 8:10am & 10:25am. Flight time is about 1 hour 55 minutes. Also consider tagging the trip along with some time in Koh Samui, another beautiful island in Thailand. Return flights to Singapore departure at 9:55am and 11:50 with Silk Air. Bangkok Airways offers flights at 5:25pm and 8:35pm. Once you arrive in Koh Samui you need to take the ferry to Koh Phangan. The best option is with Lomprayah, their ferries take only 30 minutes to reach Koh Phangan and ticket costs SGD 12.00. Pranan Pier also known as Maenan Pier. It’s located about 30 minutes driving from the airport. Boats departure at 8:00am and 12:30pm. Nathon pier. Located about 50 minutes driving from the airport. Boats to Koh Phangan departure at 11:15am, 1:30pm, 5pm and 7pm. To return Lomprayah offers 2 ferries from Koh Phangan to Pranan pier at 11am and 4:20pm. And 4 ferries to Nathon pier at 7:20am, 9am, 12pm and 2:30pm. Bear in mind that the journey from Haad Rin beach to Tong Sala Pier, where the ferry departs, takes around 30 minutes. Getting around Koh Phangan is relatively easy. Renting a motorbike is the best way to get around and motorbike hire shops are everywhere and can be rented for just SGD 5.00. Don’t forget your driver license! If you haven’t ridden a motorbike before, cycling is a healthier and safer option of getting around. Upon arrival at the pier in Haad Rin, there will be lots of taxis waiting to take you to your accommodation. Taxis in Thailand hold around 8-10 adults so it’s a good idea to share with others and split the fare. Another option for getting around is taking a spin on a long tail boat (the ones that feature in all the Thai postcards). There will be no set price so just wear your friendliest smile and negotiate with the driver. 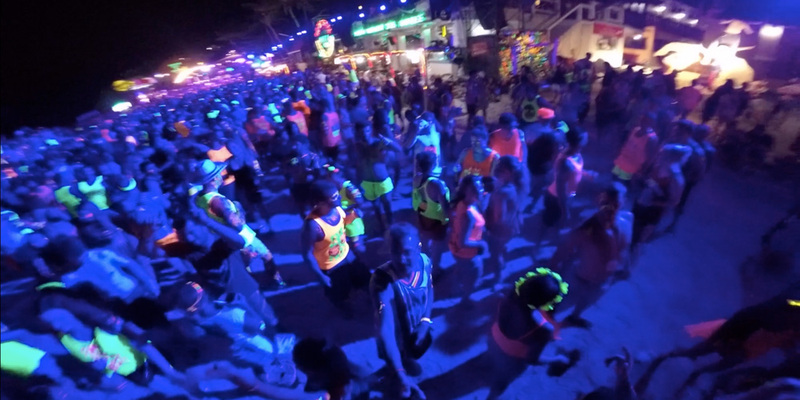 The full moon is the king of all beach parties and with that does come risks to be mindful of, fake alcohol and drugs are not rare in the Full Moon Party. Only drink from sealed bottles and DO NOT do drugs. Despite the party vibe drugs are illegal in Thailand. Do not by any means take any valuables with you on the night, pickpockets are very active here. This is not the place to show off your latest designer watch so just bring the necessities including your phone (in case you lose your friends), which should make sure to strap somewhere where it cannot be snatched, some money and your best dancing skills! Do not come to the full moon barefoot. I know you’re thinking this would be ideal for a beach party but the beach gets really messy and covered in anything and everything so you would be stepping on broken glass, cigarette butts and worse. 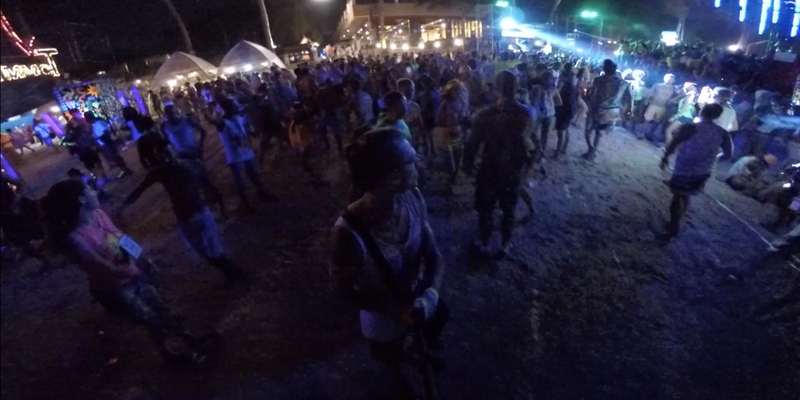 Koh Phangan is known as the party island not only because of the Full Moon Party. There are other parties that happen in different dates such as the Jungle Experience or the Half Moon Party. The fans of Trance music will have a blast at the Black Moon Culture. Finally, don’t forget to have fun and lots of it. It’s a night that you’ll remember forever. Happy Mooning!